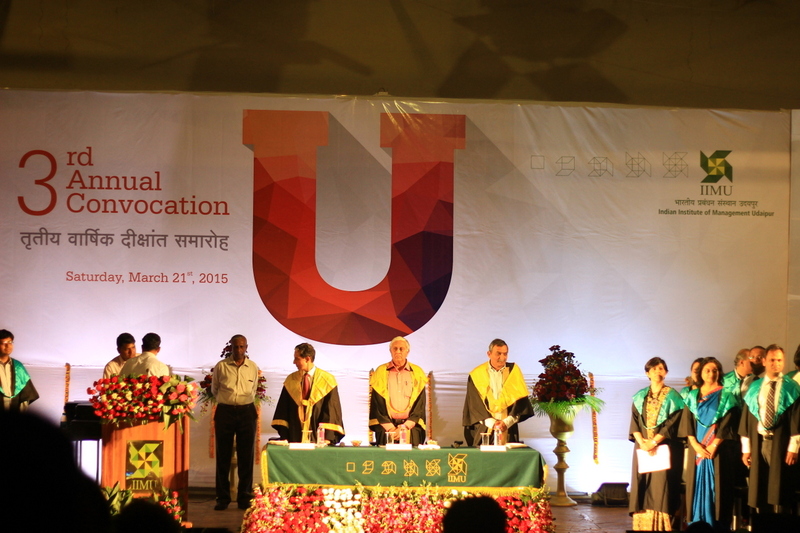 Indian Institute of Management Udaipur (IIM Udaipur) hosted its 3rd Annual Convocation on Saturday, March 21, 2015. The occasion witnessed a ceremony with eminent stalwarts of the industry and society drawn together in an engaging alliance. 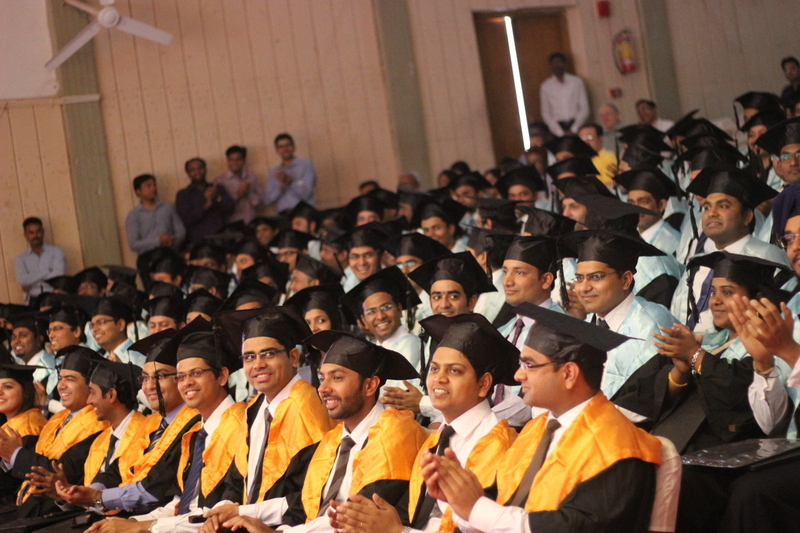 The Ceremony was held at MLSU Auditorium of Mohan Lal Sukhadia University Campus. This year, the Chief Guest of the event was Mr. R. Gopalakrishnan, Chairman of Tata Sons. The convocation was declared open by Mr. C.K. 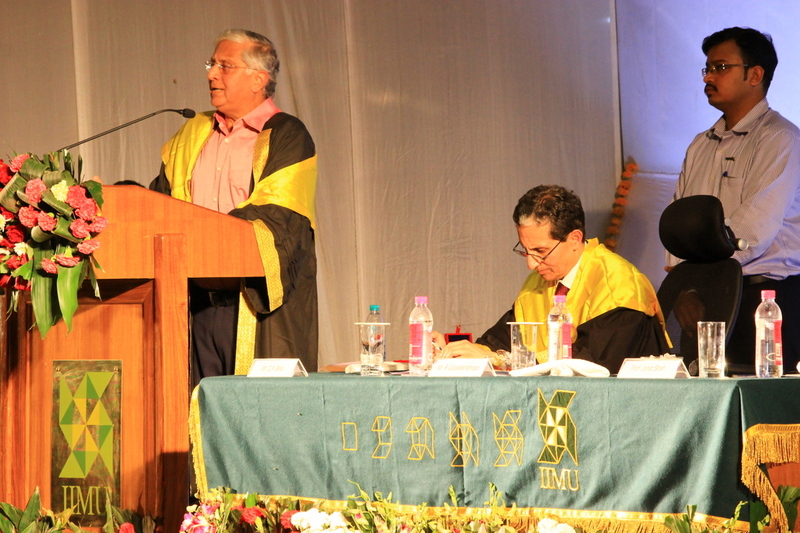 Birla, Chairperson of the Board of Governors of IIMU. In his welcome address, Mr. C.K. Birla expressed his sincere gratitude to Mr. Gopalakrishnan for having agreed to deliver the 3rd Annual Convocation address at IIM Udaipur. 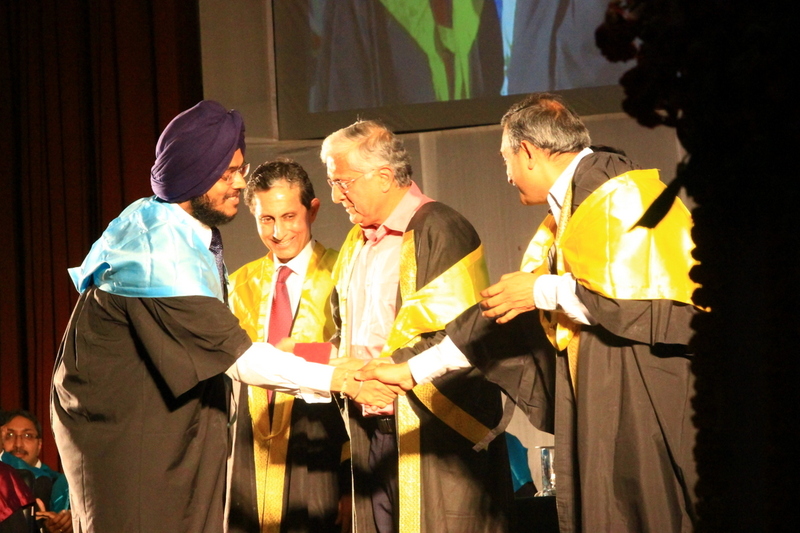 The honorable Chief Guest Mr. R Gopalakrishnan in his convocation address advised the graduating students to always balance their professional life with their personal life. He told students that when you go out in the society it will be good to remind themselves about all the labors that have been put into them by their parents, teachers & mentors. Prof. Janat Shah, Director of the Institute, delivered the concluding address. Prof. Shah told the passing out batch that the Institute has the confidence that they will make the Institute as well as the country proud through their achievements. During the third Convocation, 11 Post Graduate Programme in Management for Executives (PGPX) participants and 110 Post Graduate Programme (PGP) participants received the Diploma. 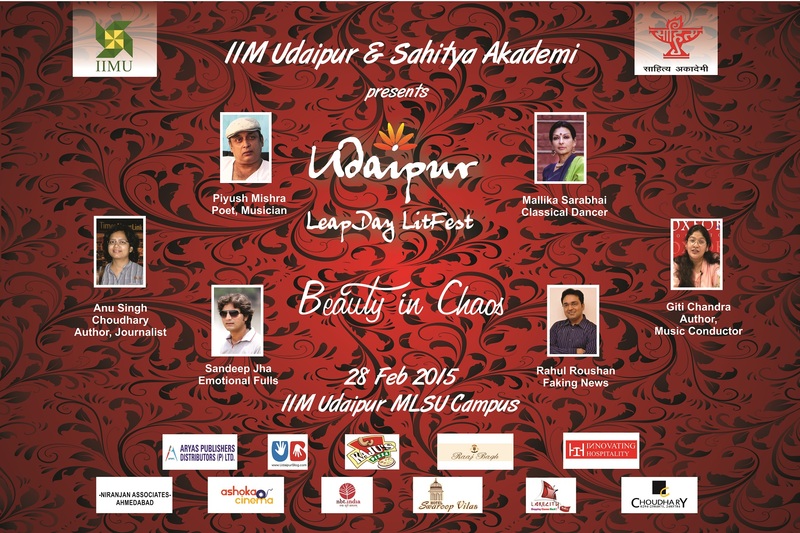 Potpourri – The literary and debating club of IIM Udaipur is hosting The Udaipur LeapDay Litfest 2015, IIMU’s annual B-school literature festival in its Udaipur campus. This is the third such edition of the event, and is slated on the 28th of February this year, as every year. The Udaipur LeapDay Litfest was conceived by the first batch of students of IIM Udaipur, simply out of its love literature, helped by the support of the IIM Udaipur culture that encouraged it to conceive and execute such a unique concept. Over the years, the ULLF has evolved into a strong name in itself, becoming Udaipur’s very own Literature Festival and a platform for the local aspirants and enthusiasts to interact with renowned as well as upcoming artists and performers from across the length and breadth of this country. The first edition, themed ‘Indian Mythology and Fantasy through new-age fiction’, hosted authors Rashmi Bansal, Ashwin Sanghi and Rajiv Menon who gave beautiful insights on the topic and also made the panel discussions very relevant for the predominantly management crowd that had gathered. The second edition, themed ‘An Odyssey of Expressions’ , however saw increased participation from the junta of Udaipur, and also a much more variedly experienced set of guests in authors Nikhil Sachan, Chetan Mahajan, classical singer Vidya Rao and Artist painter Siddharth. 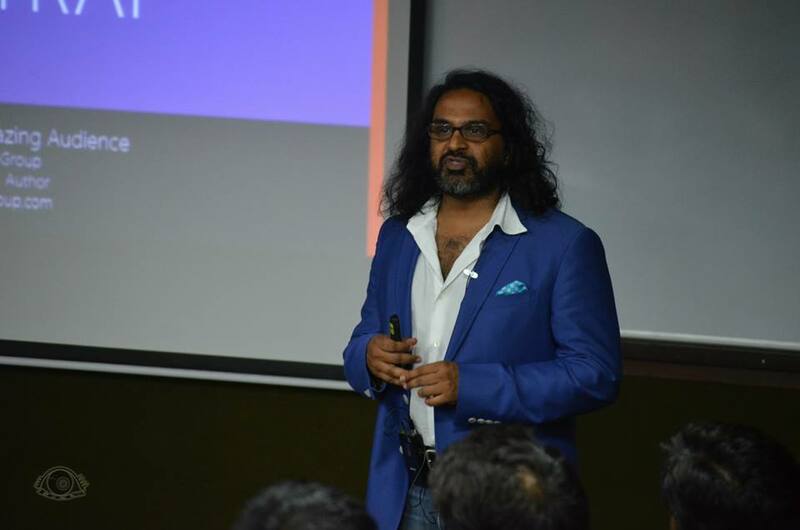 While the first two speakers were of management background, the other two were much experienced in the fields of art, and hence took the entire audience through a beautiful journey of their own illustrious careers. The theme for this year’s event – ‘Beauty in Chaos’, looks to celebrate the charming order that takes shape in all the turbulent journey of an artist. This year, the ULLF 2015 has grown much in size as a platform for Udaipur, and in stature in terms of the participating guests as well. Participating guests include Indian classical dancer and Padma Bhushan Dr. Mallika Sarabhai; Musician, poet and actor Mr. Piyush Mishra. Apart from these guests, ULLF 2015 will also be hosting, Ladli award winner for her writing on gender sensitivity, and author of e-retail record-breaking collection of short stories ‘Neela Scarf’, Ms. Anu Singh Chaudary; Asst Professor with the Department of English at St. Stephen’s, Delhi, musician and music conductor, and author of the ‘Book of Guardians’ trilogy, Ms. Giti Chandra; Founder of online entertainment channel ‘EmotionalFulls’ Mr. Sandeep Jha; and founder of online satire-news portal ‘Faking News’, Mr. Rahul Roushan. This year’s event has been sponsored by Sahitya Akademi and co-sponsored by Aryas Publications, Niranjan Associates, Ashoka Cinemas and Pirates Publications, education partner National Book Trust and food partner Jaisingh Garh, Raaj Bagh and Kaju’s. As a pre-runner, Potpourri also conducted Tell-a-Tale, a story writing marathon, hosting budding and aspiring authors and writers from Udaipur, Kota and Jaipur and the IIMU community as well. The event was a huge success going by the feedback of the participants, and event video will also be showcased during the Litfest. Going forward Tell-a-Tale will grow into a much bigger platform, inviting and encouraging participants from far and wide. This year too, the participation of the external community in the ULLF is touted to increase from last year, a healthy trend towards making the ULLF truly, Udaipur’s very own literature festival. The much awaited foundation stone laying ceremony of IIM Udaipur was held on 13th February, 2015 at the site of the institute’s upcoming campus at Balicha, Udaipur. The Balicha campus, which is spread over an expanse of 253 acres, is set to be the largest IIM campus in the country. The campus will have state of the art facilities in terms of both academics and extra-curricular activities, to facilitate holistic development of its students. In accordance with IIM Udaipur’s constant endeavor to be environment-friendly, particular emphasis is being laid on ensuring that the new campus is a green campus, with over fifty percent of space being reserved for parks. The new campus will also house twenty-seven water bodies of different sizes. With the vision of setting new standards for sustainable and energy efficient academic institutions, construction of the new campus was initiated on barren land of 300 acres which was devoid of vegetation. With the help of xeriscaping and added area research, a green belt is being created which will be an inspiration for the native arid zone. Traditional water harvesting systems are being employed, to create a self-sustainable campus in terms of water demand, which will help neighbouring villages and surrounding zones to achieve water efficiency. In terms of green technology, the highlight of the new campus is that it will be a net zero-waste campus where all waste will be treated as a resource. The ceremony began with the unveiling of the foundation stone by the Chief Guest, Smt. Smriti Zubin Irani – Union Minister of Human Resource Development, Government of India. The event also had Smt. Vasundhara Raje – Chief Minister of Rajasthan as the Guest of Honour. Post the unveiling of the foundation stone, the lighting of the lamp was done by Smt. Smriti Irani and Smt. Vasundhara Raje. The welcome address was then given by Shri. 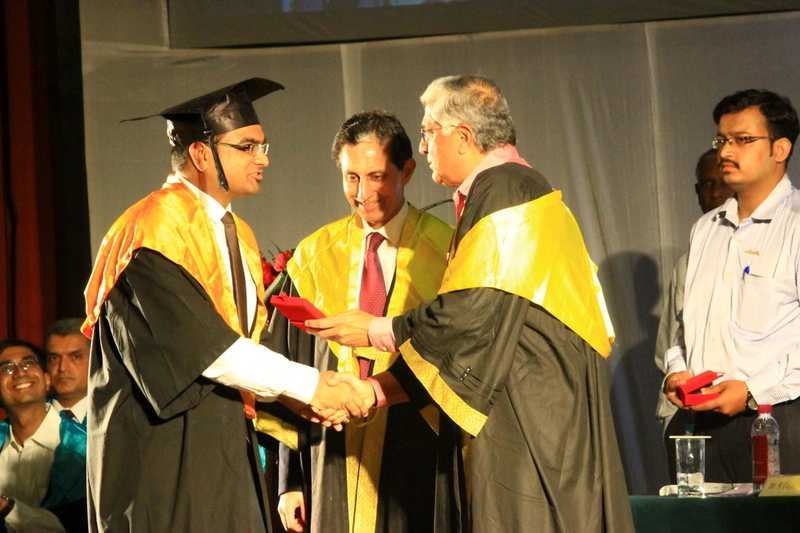 C. K. Birla, Chairman – Board of Governors, IIM Udaipur. 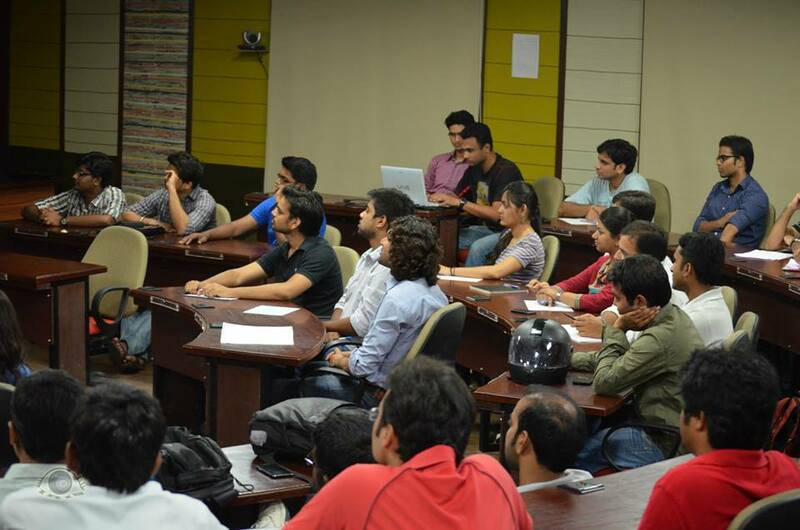 Mr. Birla spoke about the role of management institutes as a bridge between academia and industry. He also mentioned that the vision of IIM Udaipur is being committed to research and generation of new knowledge in the field of management. IIM Udaipur would be achieving this, through its mission to inculcate values that will guide the journey of its students as leaders. Mr. Birla also discussed at length about IIM Udaipur’s emphasis on development of the region and on constantly striving to be a world class institute. Smt. 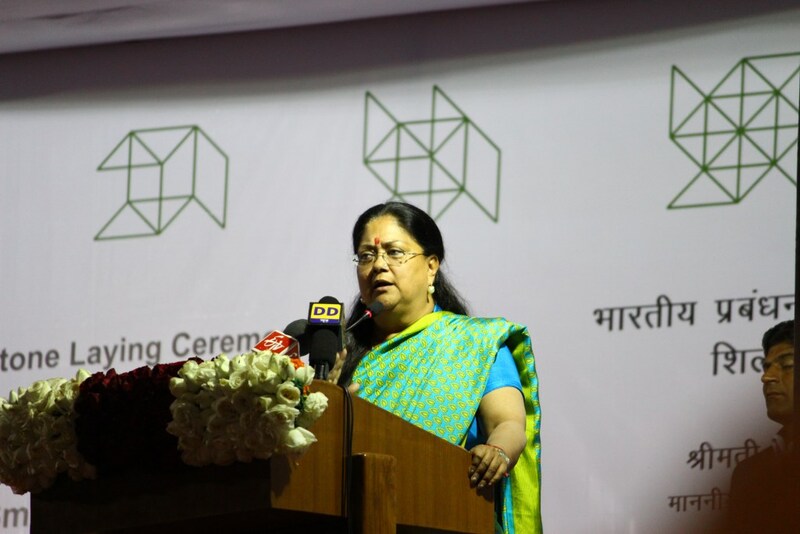 Vasundhara Raje heralded the laying of IIM Udaipur’s foundation stone, as a very prestigious event for the region. 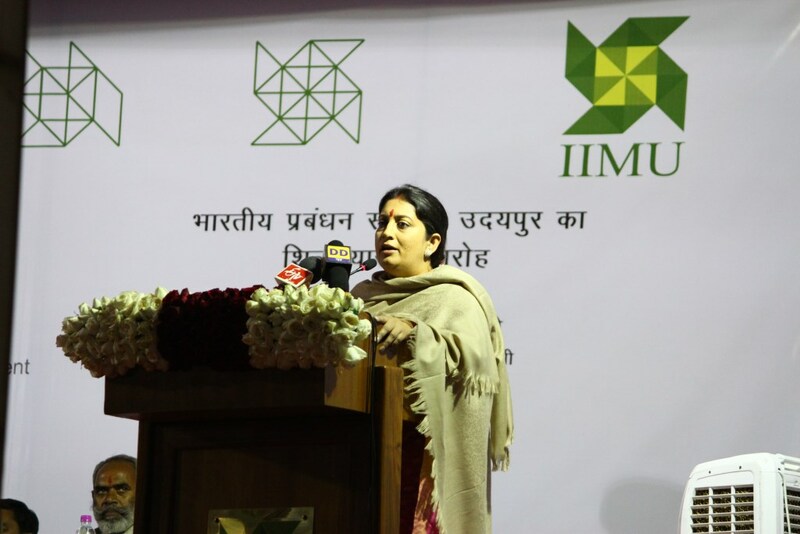 She emphasized on the need for IIM Udaipur to become a Centre of Excellence for Rajasthan. Smt. Smriti Irani then addressed the audience and mentioned the laying of the foundation stone as an initiative to give substance to the dreams of many aspiring students. Ms. Irani also discussed about initiatives that should be taken up at IIM Udaipur, namely world class water management research that would benefit the entire state of Rajasthan, adoption of five surrounding villages by the institute to help improve their standard of living, use of agro-based industry skill development technologies from India and abroad at the institute, and development of a centre for tourism and hospitality on the campus. 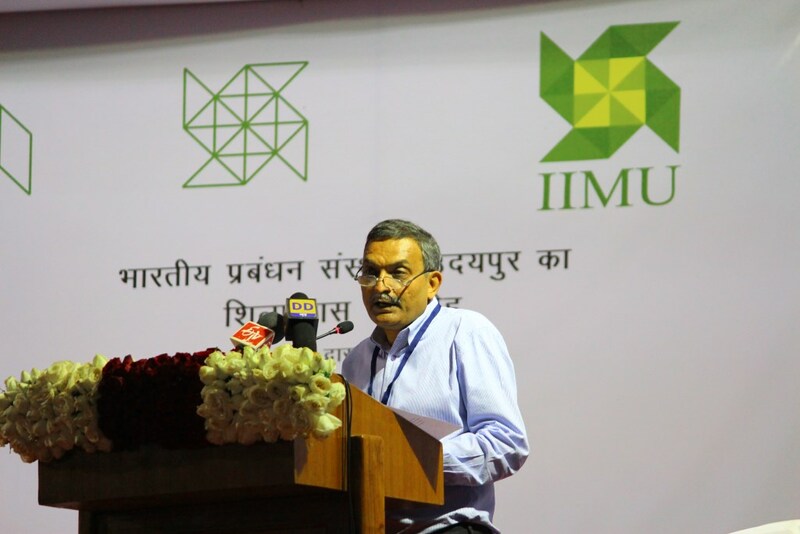 Prof. Janat Shah, Director – IIM Udaipur then expressed his gratitude to all individuals, organizations and especially the Centre and State of Rajasthan, for their unwavering commitment and support. Some of the other dignitaries who attended the ceremony were Shri Arjun Lal Meena – MP (Lok Sabha), Shri Phool Singh Meena, MLA – Udaipur Rural, Shri Kewal Nohria, Member – Board of Governors, IIM Udaipur, Shri Shailendra Kumar, Director (Management) – MHRD, Govt. of India, Shri Ashwini Bhagat, Secretary – Higher Education, Govt. of Rajasthan, Prof. I.V. Trivedi, Vice Chancellor – Mohan Lal Sukhadia University, Shri Bhawani Singh Detha – Tribal Commissioner and Shri. 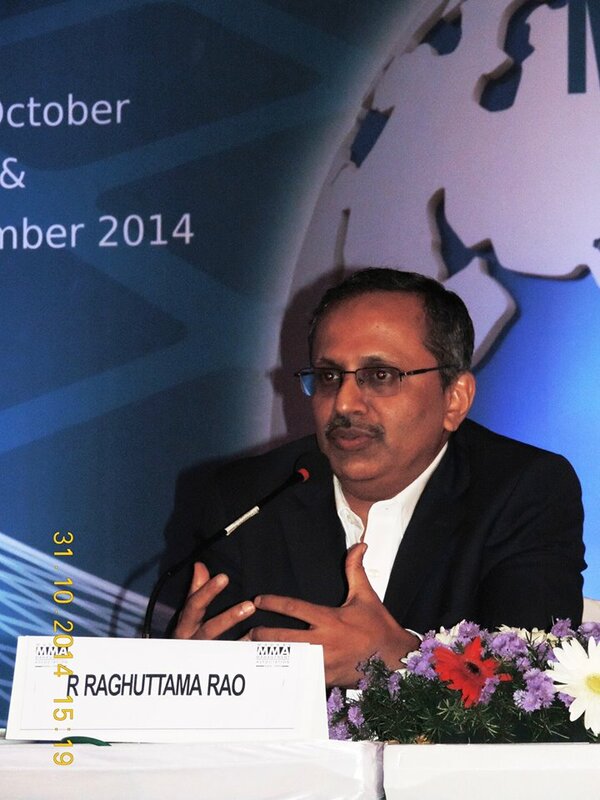 Rajendra Pawar, Chariman – NIIT & Member – Board of Governors, IIM Udaipur. The ceremony came to an end with the playing of the National Anthem. With the laying of the foundation stone, work on the new campus has begun in full swing. Future batches of IIM Udaipur can look forward to moving to a campus with world class amenities that is known for the competitive students it produces, as also for its constant efforts to build a sustainable campus that works with the local community to create an ecology that is beneficial to both the institute and the region.